Reports of the typewriter’s death have been greatly exaggerated. Newspapers all over the world might run headlines of their extinction (“Last Typewriter Factory Left in the World Closes Its Doors!”), but hey: newspaper editors love stories about extinction, as long as they’re not about newspapers. Even now, small office supply companies quietly manufacture typewriters, and boutique businesses now devote themselves to restoring the old beasts like prized antiques. As recently as 2009, the New York City Police Department spent close to $1 million on typewriters (though this is more evidence of gross inefficiency, probably), and “type-ins”—special evenings where people gather to tap out hand-typed letters—are becoming big amongst hipsters. Using typewriters remind us of an era where gentlemen still remembered how to write: in full words, and not just emoticons and shortcuts. With a typewriter, there is no room for CTRL+X or CTRL+V, and less chance to regret what you wrote. Every word, every sentence and every paragraph has to be considered, typed slowly and in logical, sequential order. No room for typos. As Pulitzer Prize-winning biographer Robert A. Caro once said: “One reason I type is it simply makes me feel closer to my words. It’s like being a cabinetmaker. It’s like laying down the planks. 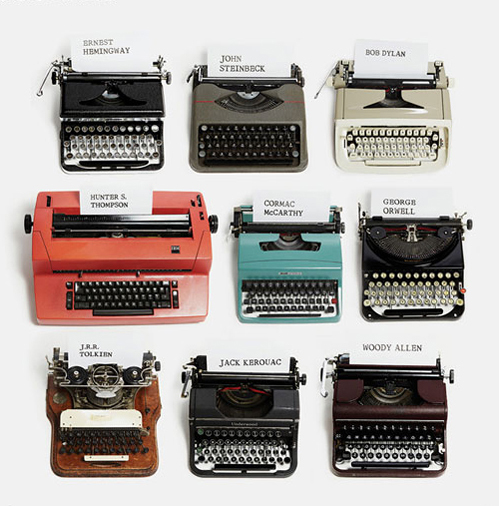 This is the way it’s supposed to feel.” Here are some other gentlemen of letters, fond of the hand-typed manuscript. Para ler na íntegra aqui. Faltou a máquina da Agatha Christie!